Galactic superclusters start to form. Our galaxy belongs into the Laniakea super cluster, which includes the local Virgo galaxy cluster, and a huge number of other galaxy groups and clusters. Superclusters of galaxies are even larger structures than galaxy clusters. Superclusters are so large that they haven’t settled into equilibrium yet. Their birth, motions and shape are defined by the expansion of the Universe and the gravity of dark matter. 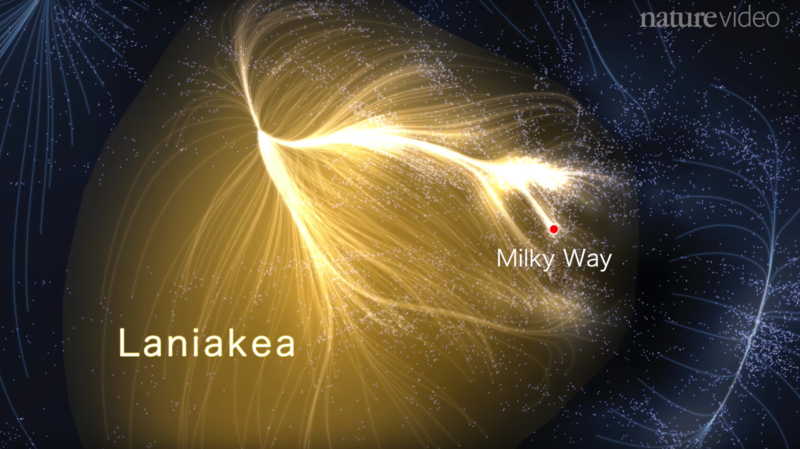 The Milky Way belongs into the Laniakea supercluster, which only recently has been recognized as a one large structure by the scientists. Laniakea includes our local galaxy group, the Virgo galaxy cluster, and a huge number of other galaxy groups and clusters, which all move slowly towards a Great Attractor galaxy cluster. The Laniakea is more than 500 million light years in cross-section, while the size of our own local galaxy group is about 10 million light years. Thus, our “address in the Universe” is: The Earth, the Solar System, Milky Way, Laniakea. The name Laniakea comes from Hawaiian languages and means “immeasurable heaven”.